In Barbados, the rum shop is an exhilarating getaway, a safe haven, a gaming spot, a stage for worldly conversation and so much more. Our island is blessed to have hundreds all over, and it is at these small hubs of large Bajan culture, that rum and good fellowship go hand-in-hand. One rum shop in particular, however, has an offer that just can’t be beat. 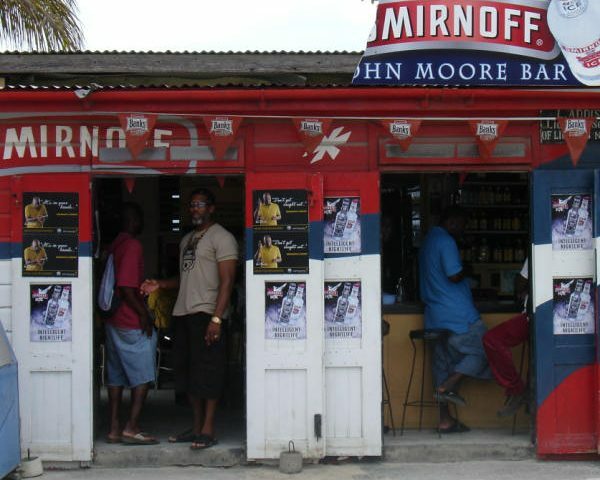 John Moore Rum Shop, located in Weston, St. James provides patrons with the typically charismatic Bajan hospitality and an unmatched ambience crafted by the sun, sea and sand. Picture it: you and your friends or family have just gotten your Mount Gay rum, ice and chaser, and you sit on John Moore’s verandah looking off at the sunset with the charms of good music, fun banter and singing birds in the background. John Moore Rum Shop is typically open every day; but we’d recommend visiting an hour before sunset to soak up the atmosphere, energy and of course, a little bit of rum.